STRATACACHE has launched a new, interactive solution designed to empower customers to become more involved in the shopping experience. Unveiled at Retail’s BIG Show at New York’s Jacob K. Javits Convention Center in booth #2523, STRATACACHE’s Digital Play solution displays high-definition, interactive product and brand messages programmed to respond when a consumer interacts with sales and marketing content via motion-based gestures. Unique for consumers of all ages, retailers can promote products and interact with customers all along the path-to-purchase. The Digital Play experience engages consumers to interact with featured messaging, increasing customer recall. 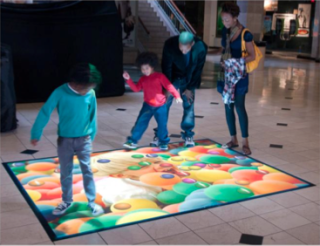 Gestural Interactive Floor displays content projected onto a 6x8 foot area on the floor that creates an “attract zone” in key retail locations. Gestural Interactive Wall displays content onto a 2x2, 3x3, or 4x4 video wall of 46" high-definition displays or wall projection technology. Augmented Reality (AR) engages consumers by overlaying graphics onto a real-world image, helping consumers envision products and making the purchase decision easier. AR is for use with the floor projection or wall displays. Virtual Reality (VR) displays products or services within a virtual environment, using graphics to enhance and contextualize a scene or product. VR is for use with floor projection or wall displays.